MONTREAL -- Quebec's top court has accepted to hear the appeal of a former doctor who stabbed his children to death and was ordered to spend at least 17 years behind bars. 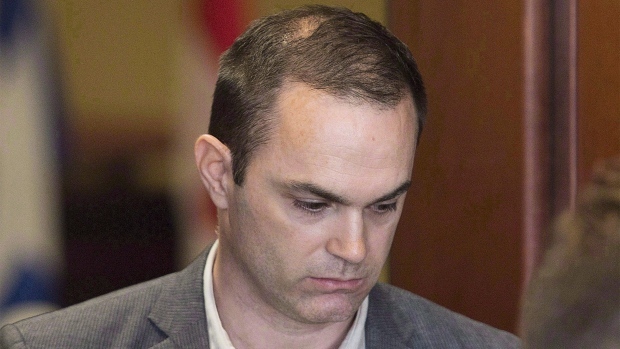 Guy Turcotte's attorneys were hoping to seek permission today to appeal a judge's ruling that he not be allowed to apply for parole until the 17 years are up. But Justice Marie St-Pierre of the Quebec Court of Appeal said that since the appeal was actually based on a question of law alone, it wasn't necessary to seek permission. Instead, the challenge of the parole eligibility will be folded into an earlier appeal against his conviction on second-degree murder. It will be heard sometime late this year or early 2017. In December, a jury found Turcotte guilty in the February 2009 deaths of Olivier, 5, and Anne-Sophie, 3, who were stabbed a total of 46 times. Last month, Quebec Superior Court Justice Andre Vincent ruled that Turcotte, 43, must serve at least 17 years before he can seek parole. The judge said it reflected the "heinous and horrible crimes."